Taxis are everywhere in Bangkok and can be a cheap and comfortable way to get around town. However, everyone struggles to find a taxi willing to do the right thing and get them from point A to point B, using the meter. Tourists often think this is a practice that is targeted solely at them, but actually, everyone in Bangkok has difficulties when trying to catch a taxi. There are approximately 140,000 official licensed taxis in Bangkok. These licensed taxis tend to be brightly coloured sedans (and sometimes micro-SUVs) with prominent “Taxi Meter” signs on the roof, and a red light in the front window (passenger side) that reads “ว่าง” (pronounced “wang”) which means “free”. The writing in Thai on the sides of each taxi indicates which company the taxi belongs to, or which taxi cooperative the driver belongs to. Some taxis are owned outright by its driver (in which case, the driver joins an independent taxi cooperative) while other taxis (the majority) are owned by one of several large taxi companies and the drivers lease the cars in shifts. Whether the driver of a taxi owns or leases a car, life as a taxi driver in Bangkok is actually pretty harsh and the money they make is pretty small. Given the costs of owning or leasing a cab versus the cheap fares, the taxi driver’s profit is very small and most taxi drivers earn anywhere between minimum wage and up to 15,000 baht per month. Keep in mind that most taxi drivers are from poorer families in the North East region of Thailand and they have come to Bangkok to make money due to a lack of opportunities or financial hardship at home. Therefore in addition to their costs of living in Bangkok, they normally also need to save as much as possible each month to send back home. As the sign on the roof declares, all taxis in Bangkok are required to have “meters” (or “metres” for the non-Americans like me). Taxi meters became compulsory in the early 1990s, and prior to then you had to negotiate the fare with the taxi driver before getting into the cab. Now the taxi driver must switch on the meter when you get in, although you will still find occasions when a driver refuses to do so (I will discuss this issue later). Since taxi meters were introduced, the fares have only increased twice over the years, and not by very much. They certainly have not kept up with inflation in Thailand. Flag fall – when you first enter the taxi – is 35 baht, and this covers the first 1 km. From 1 – 10kms, the rate is 5.5 baht per km. From 20 – 40kms, the rate increases to 7.5 baht per km, and keeps going up until the 80km + mark, where it maxes out at 10.5 baht per km. (however, even at 40km, you will be outside of Bangkok, and taxis will rarely if ever agree to use the meter for trips outside Bangkok and instead such trips need to be negotiated at a flat rate). When the taxi is stuck in a traffic jam (ie when the taxi moves slower than 6km/h) the meter will charge 2 baht per minute. To give you an idea of how little the rates have increased, the flag fall has not changed at all (it has always been 35 baht), but previously you would get up to 2km for that fare, now only 1km. However, after flagfall, the rate has only increased by 0.5 baht per km, and the traffic jam rate has also only increased by 0.5 baht per km. As a guide to how much a typical Bangkok fare will cost you, a run of about 15km from Lard Prao Road to Chitlom Road, going through Rama IX, and encountering little traffic will cost you about 123 baht. This is considered to be quite a lengthy trip within the Bangkok metro area. Prior to the rate increase, this same fare would have cost you 106 baht. 1. Taxis do not want to go to your destination. This is the biggest problem experienced by everyone in Bangkok. There are two main reasons why you will get a taxi driver who is unwilling to go to your destination. The biggest reason is that the taxi driver is nearing the end of his shift and your destination puts him at the wrong end of town. As I highlighted above, most taxi drivers work for a taxi company and do not own their own cars. Instead, they lease them on shifts for different periods of the day (usually an 8 hour shift, that costs the driver about 600 baht). Prior to the end of their shift, the driver must return his or her car to the company lot, with the LP gas tank refilled (another 300 baht). If the driver returns the car late, he or she is charged a penalty which often means the loss of that days profits. 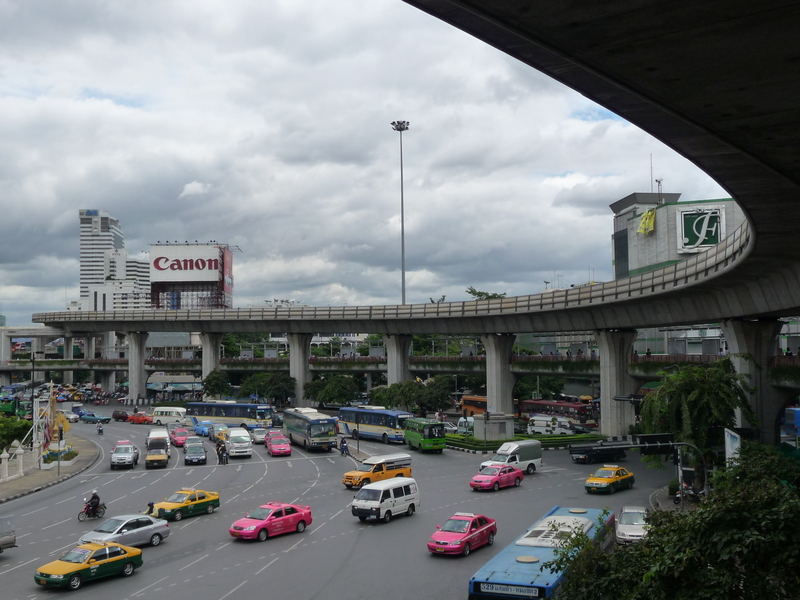 The second reason why a taxi may not want to go to your destination is that the way to get there is heavily congested, or it is far away and the driver is unlikely to get a return fare back to his sector of Bangkok. So what is the solution? This issue is significant enough that the government actually passed a law prohibiting taxi drivers from refusing a fare. You therefore could report the driver. However, given the issues I have already highlighted, I consider this to be a bit unfair and the driver may experience genuine hardship if he takes you to your destination. Even though you have reported the driver, it still doesn’t get you to your destination, and if you act hostile and pick a fight with a driver, then the only destination that you may end up at is a hospital emergency room. Accordingly, the best practice is to just wave that taxi on, and stop another one. A good tip here when you have a an unpopular destination is to focus on stopping the yellow and green taxis as these are privately owned. The driver is likely to have less hardship in getting you to your destination and you also tend to get better service. Look at all the multi-coloured taxies. Green and yellow is privately owned and pink are corporate leases. If the little red light in the passenger window is shining, then the taxi is available. 2. Taxis refuse to use their meter. As mentioned, use of the meter is law. However, many tourists in particular are likely to regularly come across drivers who refuse to use the meter and instead refuse to go unless an inflated fare is agreed to. The reason why tourists regularly experience this is because there is a “taxi mafia” or illegal collective of taxi drivers who park their cars outside major tourist attractions and hotels. All of the drivers in the collective band together and will refuse to use the meter. Although this practice is most prevalent in tourist areas (because tourists are the easiest victims, and Thais and expatriates are much less likely to put up with such a practice), there are times when locals get hit with it as well. For instance, if there is a severe downpour, massive traffic jam or at closing time at a major night entertainment area, taxis may insist on pre-agreed fares. In the first two examples, it is because the taxi knows it will be stuck in traffic and the driver wants to ensure he doesn’t incur a loss. In the latter example, taxi drivers are being opportunistic when passengers are at a disadvantage (ie BTS is closed so there are few transport options to get home). What should you do? First, avoid the taxis lined up in front of major tourist attractions like the Grand Palace and Wat Po. The taxis parked out front of major hotels are usually in the same boat, although I have found that taxis parked down side streets in residential areas and lesser known hotels are less predatory. The best is to wave down a taxi that is driving past, or that has just dropped off passengers. These are usually not part of the taxi mafia. Sometimes, you may need to walk a little bit to get away from the attraction or hotel. For instance, when Patpong closes at night, all the taxis stopped on the Patpong side of Silom Road are mafia (and they often make trouble for other taxis driving past, if they stop for passengers). Accordingly, cross over to the other side of Silom, or walk further down Silom away from the mafia area. When you get into a cab, the first thing the taxi driver should do once he understands your destination is to turn the meter on (you will know because it will start off by displaying 35 baht, ie the initial rate for the first 1 km). If he refuses to turn on the meter, then ask the driver about the meter and if he refuses to turn it on, then ask him to stop and get out. 3. Taxi doesn’t know how to get to your destination. This happens to everyone at some stage. It happens more to tourists because of a lack of any Thai language skills and poor pronunciation of the destination. It also happens to everyone else because there is no real street knowledge test required before a taxi license is issued. Given that most taxi drivers do not come from Bangkok, you will eventually get newer drivers that have no idea how to get around to even the more common destinations. This problem is compounded when the Thai concept of “face” results in the taxi driver refusing to admit that he or she doesn’t know how to get to your destination. (a) have your destination written in Thai, such as a business card or internet print-out. If it shows a basic map with main streets in Thai, this will improve chances. However, showing your tourist map to the driver may not help as many drivers have difficulty in reading maps. (b) identify the major landmark(s) near your destination. Sometimes it is easier to just tell the taxi driver initially to head to that landmark instead, and from there, you can either walk or direct the driver to the exact destination. (c) (this is more for expats) learn at least basic Thai skills such as turn left, right, straight, close, far etc and learn how to properly pronounce your destination. (d) have a Thai person you can call up on your phone who can explain to the taxi driver how to get to your destination. Sometimes, you may think that the taxi driver is intentionally taking you the long way to your destination so as to rack up the fare. I don’t think I have ever, in my 32 year history with Bangkok, ever had this happen to me intentionally. Taxi drivers make more profit on short fares (2 to 3km). Even though rates increase beyond the 10km mark, they don’t increase by that much to make it worthwhile for the driver. His interest is therefore to get you to your destination as quickly as possible so that he can get another fare as soon as possible. If he seems to be taking the long way, it is because he is lost or trying to avoid a traffic jam. 4. Catching a taxi at the airport. The two airport terminals in Bangkok regulate taxis and charge them a 50 baht fee, which gets passed on to the passenger. As part of the regulation, and for quality control, a taxi booth is set up so that passengers state their destination, which then gets recorded at the booth together with the plate number of the taxi. If there is a problem the passenger can call back to the airport and the taxi details are available to be provided to police etc if necessary. However, there will also be touts hanging around near the taxi booth, trying to sell fixed rate fares. Sometimes they are selling fares for licensed taxis, but quite often the fares are for an unlicensed vehicle. This can be quite risky for a number of reasons, and the fare will always be more expensive than if you had gone through the taxi booth. For those that want to save on the 50 baht fee (and also avoid waiting in line at the taxi booth), you can simply go upstairs to the departures drop off area and catch a taxi just as it drops off passengers. Make sure the taxi is happy to use the meter though (they usually will be as it means they get an immediate return fare to Bangkok). 5. Expressways and Tollways. When you give a destination to your driver, he or she may ask you if you are okay with using an expressway or motorway. Most of these cost money and you will be expected to pay for these in addition to your fare. Quite often you will be asked to pay for it directly at the tolling booth. Toll charges tend to be around 20 to 50 baht depending on which road and distance. 6. Arguments with Taxi Drivers. Avoid this at all times. There are plenty of really nice taxi drivers. However, there are also a sufficient number who are on edge, use drugs, are desperate people etc. Accordingly, there are plenty of reports of people being beaten or even killed by taxi drivers. In most cases, the incident occurred because the passenger decided to get into an argument with the taxi driver. Trust me, it isn’t worth it. Be polite, avoid any arguments, and don’t make the driver lose face. Due to the possibility of dangerous passengers, most taxi drivers will also have a weapon within easy reach (often a knife or iron rod, but sometimes a handgun). 7. Single Women Late at Night. Most women in Bangkok are reluctant to catch a taxi alone late at night. As mentioned, most taxi drivers are nice enough, but there have been cases of rapes and indecent assaults. If you are concerned about this, there is a specific service called “Lady Taxi” that provides female drivers and cars are equipped with GPS. To book a taxi through this service, call 081 266 6360. 8. Booking a Taxi. People don’t often use a booking service for taxis in Bangkok because it is easy enough to find a taxi at any time of the day or night within the main areas of Bangkok. However, if you must book, then some of the more popular taxi numbers you can call are: 1661 and 1681 (you often see these phone numbers on the sides of cabs). Note that you pay a small surcharge for pre-booking a taxi. 9. Mobile Phone App. A useful app for your phone when catching a taxi in Bangkok is the Department of Land Transport’s “Check-In Taxi” app. This is available for both iPhone and Android users. It lets you scan the taxi license number (either the vehicle’s plate or on the inside of your door). You can then rate your experience with the taxi (either good or bad). If you do decide to use the app though, I would recommend that either you are not obvious to the driver that you are using it, or else highlight that you are giving him a good review. 10. Proper procedure for flagging down a taxi. Don’t use your thumb like a hitch-hiker and don’t whistle like in New York. Instead, simply stand by the road, make eye contact with the vehicle and hold your hand out, palm down, and wave it up and down gently… almost like hailing a bus in the West, except Thais usually have their palm down rather than palm facing the vehicle. Although, even if you do have your palm facing the vehicle, the taxi will still understand what you want. Be aware that there are certain areas where taxis are not supposed to stop, such as at or just before intersections (eg where there are sidewalk barriers) and at bus stops. Taxis may still stop there or may pull over nearby, so you may need to walk to them. I have tried to cover off on quite a lot to help you understand the hows and whys with respect to taxis in Bangkok. Taxis are plentiful and cheap, but there are issues with them as well. As a result, my preference these days is to live, work and play close to the BTS and MRT lines, and that way I only resort to taxis when I am going somewhere off the grid, or if I am out and about after midnight (which is when the BTS and MRT close). However, with a little bit of knowledge, using taxis really doesn’t need to be that dramatic either. I would estimate that about 9 out of 10 of my taxi rides have been pleasurable. For the 1 out of 10, it’s usually been a driver who has no idea where my destination is, or wants to negotiate a fare.